Turn on; tune in; catch the perfect wave. Legendary surf movie director Bruce Brown's 1966 masterpiece THE Endless Summer follows two Californian surfers as they cross the globe on the ultimate surfing adventure. From the uncharted waters of West Africa to the shark-filled seas of Australia to the tropical paradise of Tahiti, Mike Hynson and Robert August accomplish in a few months what most people never manage in a lifetime... they live their dream. Featuring a heart-pounding surf rock soundtrack by The Sandals, The Endless Summer is regarded by many as THE surf movie – a timeless evocation of the beauty, excitement and passion of the sport. Since wowing cinemagoers in the '60s, Oscar-nominated director Bruce Brown's dazzling account of two surfers' quest for the perfect wave has captured the imagination of each new generation, captivated by Endless Summer's breathtaking celebration of surfing and surf culture. 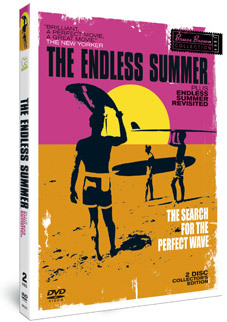 Despite its reputation, The Endless Summer has remained stubbornly unavailable on DVD in the UK, but has been announced for a UK DVD release as a 2-disc Collector's Edition on 29th August 2011 by Go Entertain at the RRP of £24.99. Also included is Dana Brown's 2000 follow-up feature Endless Summer Revisited.